In a study, AZL together with multiple companies identifies potentials and challenges of using thermoplastic tapes in injection molded components. In a follow-up project, AZL together with the established and extended consortium from the first project continue the development of a game changing machine system for manufacturing tailored composite blanks in high volumes at medium investment costs. This study will support the understanding of thermoplastic tapes in the injection molders base and will identify potentials for thermoplastic tapes in injection molding. After a successful Kick-Off Meeting on October 18th at FAKUMA fair we already started the first phase of the project involving 12 companies: AZL is currently working on the definition of the status quo and the development of an education program. 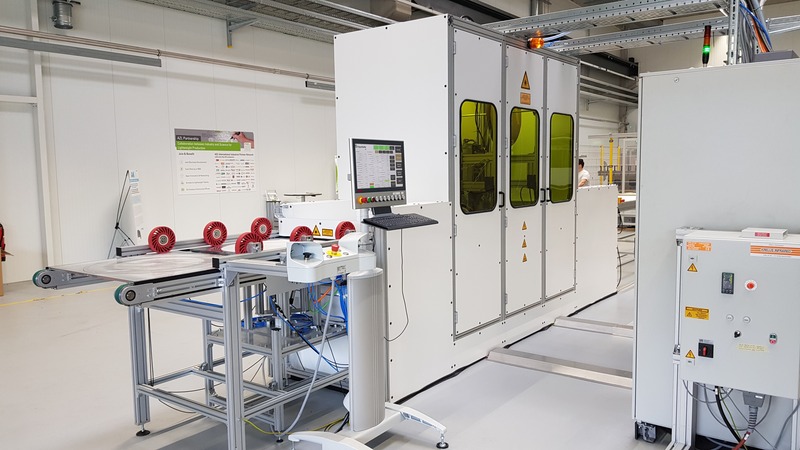 AZL completed the first project, together with 12 Partner Companies and Fraunhofer IPT, to develop a game changing machine system for manufacturing tailored composite blanks in high volumes at medium investment costs. The follow-up project will comprise the prototype upgrade and optimization for advanced material and processing studies as well as extensive material and processing studies for demonstration of wide applicability of novel machine concept. After the Kick-Off this project is also starting its first project phase for the prototype upgrade and commercialization. Both projects are still open to join.